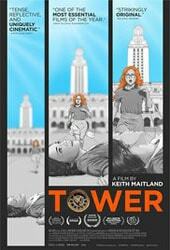 Tower is the story of the first mass school shooting, when a sniper mounted the University of Texas clock tower in 1966. Here we meet the heroes, cowards, and victims—mostly portrayed in the film with realistic animation. The day is August 1, 1966. It’s one hundred degrees under the hot Texas sun, a summer day like any other at the University of Texas at Austin. Except on this day, it rained—a sharp, cruel rain of bullets. Tower tells the story of this tragic day, the story of the first American mass school shooting, during which a deranged gunman mounted the school’s clocktower and began a murderous rampage. The carnage continued for ninety-six minutes, ultimately taking the lives of seventeen people and wounding thirty-one more. To director Keith Maitland’s credit, he never mentions the shooter’s name. Monsters deserve no fame. In creating this unique documentary masterpiece, Maitland instead brings us inside the experience of those who survived the nightmare and were forever changed. He strategically introduces the heroes, the cowards, and the victims, mostly portraying the day’s events through realistic animation. The shooting plays out in real time while the witnesses reflect back with the wisdom of the decades past. From the day’s first casualty to its dramatic—and heroic—conclusion, the locals rally and face the hellfire in a desperate attempt to end the madness. The reenactment is riveting, leaving us with a shattering, haunting message from Walter Cronkite that reminds us of our own culpability in the plague of modern American gun violence.